Six-panel doors are the most utilitarian of all styles. Perhaps that's why they're so popular. Rigid and durable, panel doors often provide the bass note for great themes in American architecture. In this example, the dark panel door is the perfect color to place the brickwork and multi-lit windows of the entry at center stage. Brass hardware warms up the entire effect without a hint of gaudiness. 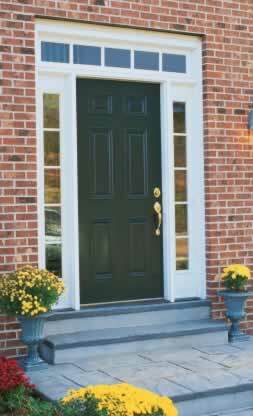 In addition to their durability, panel doors provide solid security and curb appeal. Brick homes are traditional to the American east and south, although more and more prairie style and craftsman homes borrow from the look. These panel doors are appropriate choices for the gamut of styles, including colonial, revival, classical, Italianate, neo-classical, bungalow, contemporary and even ranch homes. The six-panel doors are cost-effective alternatives when you don't want to spend a fortune on ornate or custom doors.